Failure happens, you can count on that. But what if there was a way to look into the future and predict failures and their consequences? What if you had the power to determine which failures would be the most devastating and how often they will occur? With a tool like this, you would be in the driver’s seat for managing risk. There is such a tool and it is called a Failure Mode and Effects Analysis or FMEA for short. 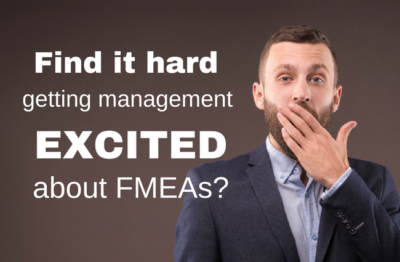 Here we highlight the relationship between FMEAs and Risk Management. 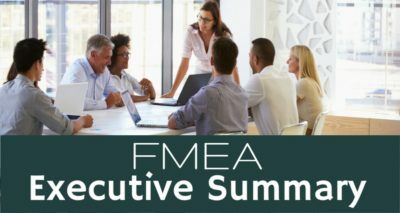 FMEAs have been around since the 1950s when reliability engineers used them to study potential problems with military systems. Safety Engineers at DuPont adapted the FMEA process to understand potential industrial hazards and to prevent accidents. For several decades automotive manufacturers have required key suppliers to provide evidence that FMEAs have been done for key processes and designs. The common theme in all of these examples is understanding and managing risk – risk of a military malfunction, risk of an accident or risk of an automotive part failure. All can be evaluated in terms of how severe the consequences of the failure are, how likely it is for the failure to occur and the chance of detecting the failure before it happens. 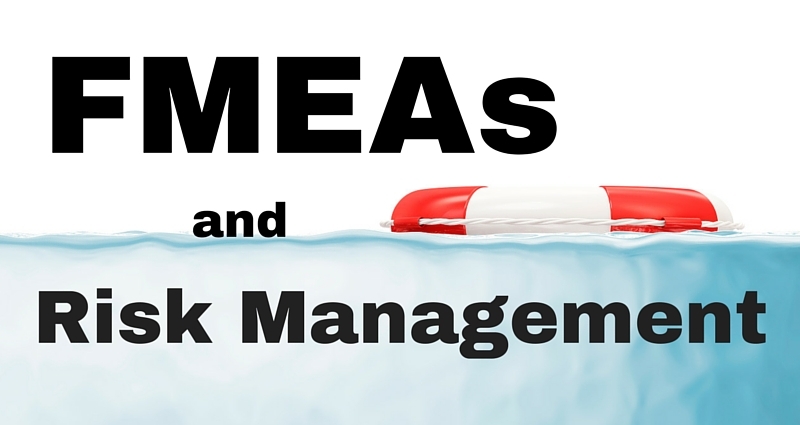 These three factors, Severity, Occurrence and Detection, each have their own scale ranging from 1 to 10 and that forms the basis of risk management within FMEAs. With an FMEA, each failure and its corresponding effect are rated on the three different scales and a Risk Priority Number (RPN) is calculated by multiplying the three ratings for each item. This provides a powerful way to evaluate the risk of each failure against the others. 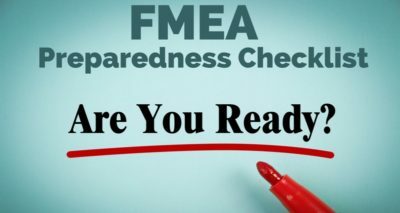 Here is a stripped down version of an FMEA worksheet to help illustrate how the FMEA process works to manage risk. The worksheet for an actual FMEA project will have a lot more detail, several more columns and many more failures listed. In this example, it is easy to see how ranking failures on these three scales and then multiplying those results can help differentiate the risk associated with the various failures. 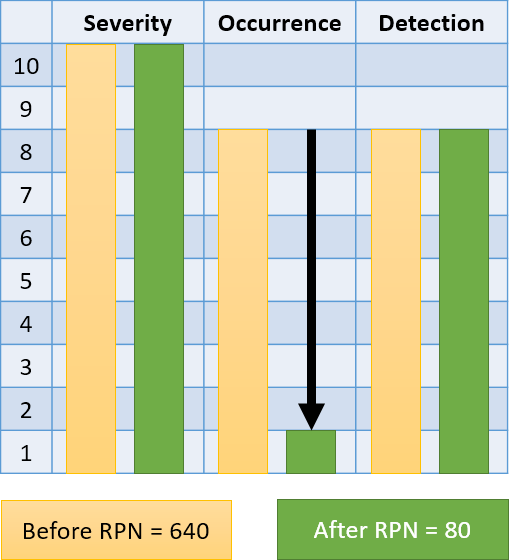 Failure 2 has an RPN that is nearly double the next highest RPN. This is clearly a high risk that needs to be dealt with. Risks associated with Failures 4 and 5 are also concerns, but should be addressed after Failure 2 is reduced or eliminated. Think of these ranking scales as slides that can move up and down. 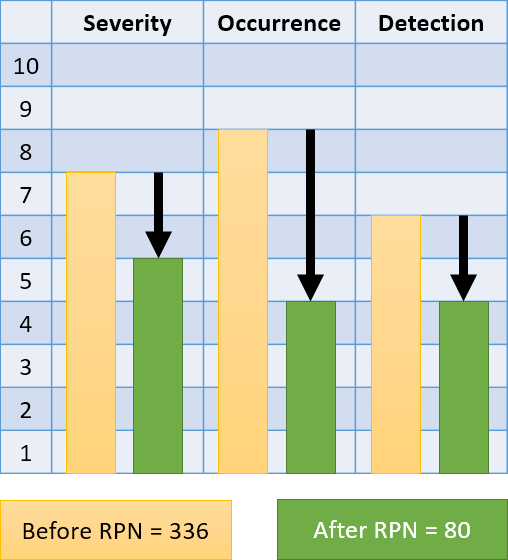 Imagine the impact on the RPN for Failure 2 if the Occurrence score can be reduced to 1. It would go from the highest RPN of 640 to the second lowest at 80. How could that be? By making it impossible for the failure to happen in the first place, for all practical purposes, the Occurrence ranking is 0, although the ranking scale only goes to 1, which is necessary in order for the RPN to calculate into a meaningful number. How do you reduce the Occurrence to 1? Well, it isn’t that easy or it would already have been done. But it also probably isn’t impossible. Here is where Mistake-Proofing comes in. This is a great example of why FMEAs and Mistake-Proofing go hand-in-hand. 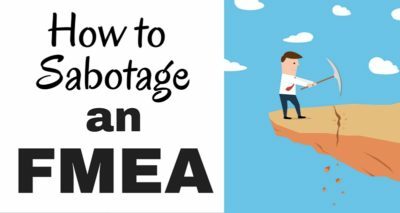 Since the goal of Mistake-Proofing is to make it impossible for failure or errors to be made, translated into FMEA terms, the goal of Mistake-Proofing is to reduce the Occurrence ranking to 1. Here we have also reduced the RPN to 80, as we did in the previous example. However, in this case, we have had to work on reducing both the Severity and Occurrence as well at the ability to detect the failure before it happens. Because these aren’t actual examples, we can’t say which of these two scenarios represents the least amount of effort for the greater return. They start by providing a framework to develop a comprehensive identification of potential risks. They assist with evaluation of those risks in terms of how severe they could be, their likelihood of occurring and the chance the potential failure has to be detected before failure. They are a tool to decide which are the most serious risks. They help point to ways to reduce the most serious risks. They enable reevaluation to determine if the risk has been sufficiently reduced or if more work needs to be done.